The Nissan Pulsar GTI-R, aka “Baby Godzilla”, becomes legal for US import in August and I’m curious as to what the hypothetical market would be for one. Skyline GTRs are well into the $17-20k range and auction prices are so high in Japan that importers have stopped importing them. Now the “hot new thing” is the GTS-T, which sell for $10-15k landed, have a similar Skyline GTR look and, most importantly, have a healthy profit margin. To me, the GTS-T is a car for the person who wants GTR but can’t afford one and is willing to settle for something looks like a GTR but lacks in the performance area. The Pulsar GTI-R on the other hand, does not lack in the performance department. For those not familiar, it’s a 227hp awd hatchback that can make an easy 260hp with the conservative boost cranked up a few. It’s got the motor from an s13 (the SR20 “red top”) with a turbo and a top-mount intercooler and the awd system from a Skyline GTS-4. 0-60mph time? Under 5 seconds. Quarter mile time? 13 seconds. Not bad for a car with 4 wheel disc brakes, independent suspension, abs, power locks/windows and a/c. It also has some other advantages over the Skyline models. The motor has huge aftermarket support and was actually sold here in the US so you can easily get parts for it at your local Autozone. The econobox version of the Pulsar was made in the zillions and shares almost all of its parts with the souped up version so body and mechanical parts are also cheap and easy to come by, aside from the awd system (though will need to be “overnighted from Japan”). 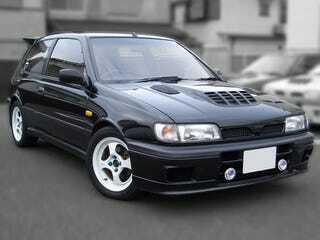 Pulsar GTI-Rs were made from 1990-1994 and where unchanged aside from some cosmetic differences. However, those cosmetic differences mean an “early” model is the one you want. They got their own unique seats (rather than the base Pulsar seats), a red GTI-R badge on the steering wheel and had the Prince logo on the front. Little things, but if you’re going to import a Pulsar GTI-R, why not import the one with the small, unique details that make it just that much more special? So, what would you theoretically pay for a low-mileage, stock, early GTI-R? Two things worth noting are that it is extremely hard to find one with the original steering wheel (most get replaced with a cheap Momo) and it is extremely hard to find one without a cage welded or bolted in the back half. $17-20k Skyline GTR range - This thing is hot and highly desirable!